Zakynthos is the third largest island of the Ionian Island complex, its area spans to 410 km2 (158 mi2) and in 2001 it had a population of 38.596. Like Kefalonia it was also ruined by the earthquake of 1953 however the inhabitants managed to reconstruct most of the houses in the original style. Capital of the island is Zakynthos town, which is also the main port. Southwest of the capital is Laganas Bay which has been declared a National Marine Park for the endangered spcies of turtles – Careta Careta. 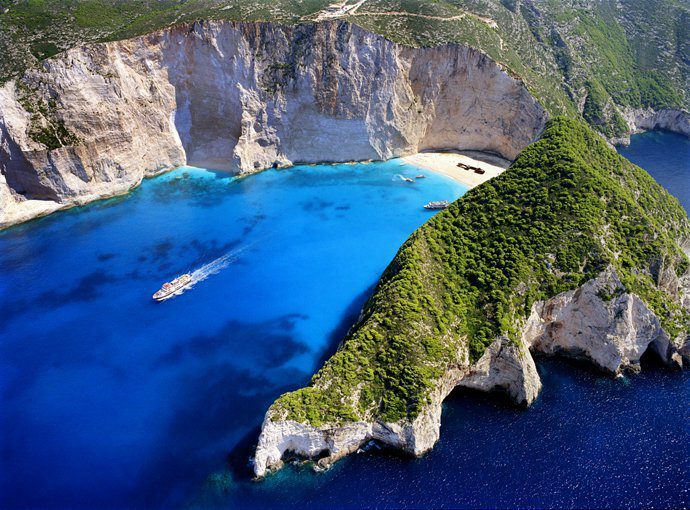 The most famous beach of Zakynthos is Shipwreck Bay but places like Kalamaki, Porto Zoro, Porto Roma, Gerakas, Vassilikos, Keri, Cape Skinari and Akrotiri have are also worth visiting. Interesting information about Zakynthos can be found through the Greek Travel Pages (GTP) and Wikipedia. Zakynthos, which is situated on the southeastern side of the island. Agios Nikolaos, which is situated on the northerneastern side of the island. The bus station is approximately 500 meters from the port of Zakynthos and the busses connect the town with the rest of the island. Ferry connections and schedules for domestic routes, like Zakynthos, are usually announced by most shipping companies, a couple of weeks before the beginning of each season. Information concerning ports serving routes to Zakynthos can be found further down. Note: Not all above connections operate throughout the year. Note: Not all above connections operate throughout the year.